1. Click here to open Encoding & Publishing page. 2. Here you can see the video format: recorded, cropped, uploaded or encoding format. 3. Here you can see the video type: mp4 and webm. 4. Here you can see the status of the video: recorded, cropped, uploaded or encoded. 5. Here you can see the video resolution. 6. Here you can see the size of the video file. 7. Here you can see the date when the video was added on the platform. 8. Click here to download the video file on your device. 9. Check this box if you want to encode the video in webm format to be available on all HTML5 devices. 10. Check this radio button to encode the video at 1080p. 11. Check this radio button to encode the video at 720p. 12. Check this radio button to encode the video at 480p. Note: encoding a video to a higher resolution than its original one will not improve the video quality, it will just increase its size and therefore more storage will be used. 13. Check this box to encode the video at 360p; 2 encodings will be used. 14. Check this box to encode the video at 240p; 2 encodings will be used. 15. Check this box to encode the video at 144p; 2 encodings will be used. 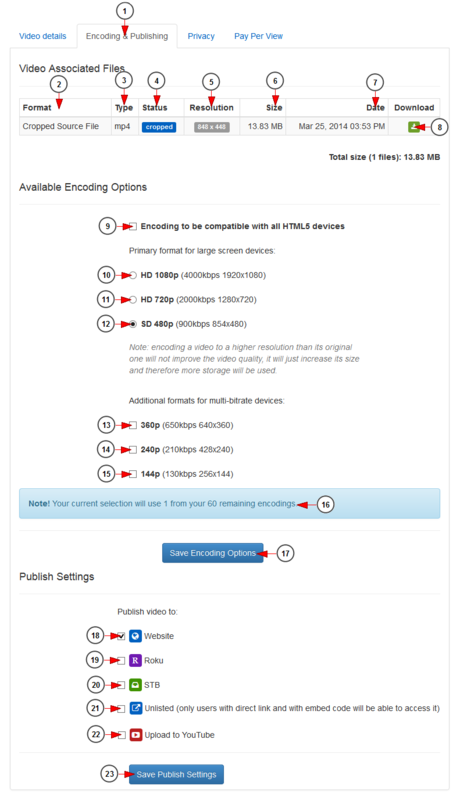 Note: the additional encoding formats (no.13 to 15) is a feature that improves viewer’s experience by enabling you to deliver videos with the resolution and bit rate that best matches the viewer’s internet connection. The video playback can fluctuate from one quality to another without any interruptions or buffering (the quality of the video can be distinguishable only by a professional eye). These additional formats can be selected only after one primary format (no.10 to 12) is selected. 16. Here you can see the number of encodings you use for the selected encoding settings and the number of total encodings for your account subscription. 17. Click here to save the encoding options. 18. Check this box to publish the video on the website. 19. Check this box to publish the video on Roku. 20. Check this box to publish the video on STB. 21. Check this box to set the video as unlisted. Only users with the video link or embed code will be able to watch the video share the video. 22. Check this box to upload video to YouTube. Note: by default, you can upload videos to YouTube that are up to 15 minutes long. You can increase your upload limit by following some simple steps. 23. Click here to save the publishing settings. Important: Once the videos are encoded, the original file will be replaced by the encoded file and its size may be different than the original size. The original files are not saved on the servers.